Psychologists and economists love to talk about the notion of two selves: present self and future self. It’s a nice way to explain the tendency to have one preference about the future, but a very different preference when the future becomes the present. On Sunday, future self might want to go to bed early on Thursday, wake up early on Friday, and hit the gym where it will listen to one hour of “Listen-and-repeat Italian” lessons while mastering the StairMaster. However, come Thursday evening’s dinner with a client, this voice cannot be heard next to that of present self saying yes to dessert, coffee, after-dinner liquer, and a postprandial visit to the pub. Sunday’s voice is also asleep Friday morning, when the present self resets the alarm from 5:30 to 8:00. In a clever April fools joke, the website www.thinkgeek.com proposed a solution in the form of an alarm clock that donates money to your most-hated cause should you hit the snooze button. Imagine giving money to a despised politician every time you slept in. Might that get you out of bed? 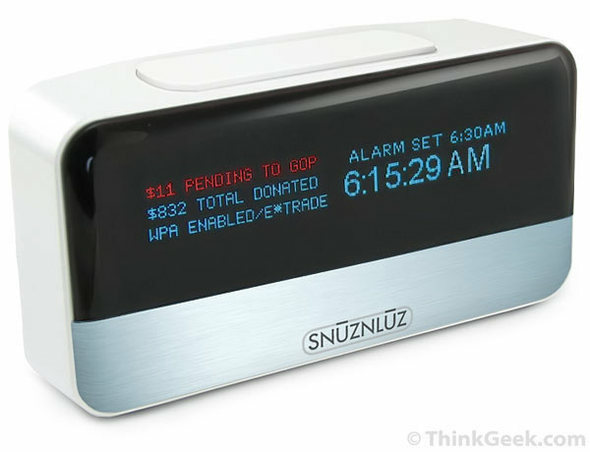 While the SnuzNLuz alarm clock was a joke, it was a brilliant one. I believe that someone will run with this or a very similar idea. Many future selves find their present selves to be their own worst enemies, and might be willing to pay obedience school tuition. In fact, the much-buzzed about www.stickk.com is built on this model: taxing yourself for failing to lose weight, quit smoking, etc. Contracts to fight procrastination was written on May 5, 2008 and filed in Research News.